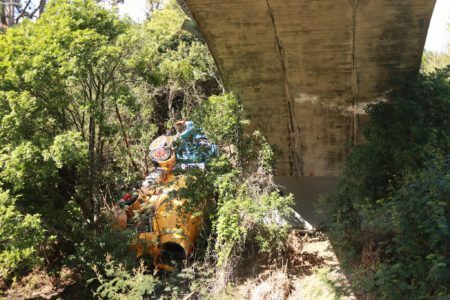 Mangemangeroa Gorge Bridge on Whitford Road has been declared safe after a concrete mixing truck went over the barrier last Thursday afternoon and landed in the gorge below. 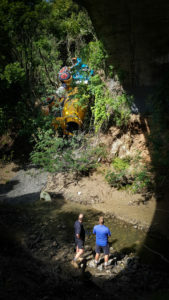 Police and emergency service were called after the truck rolled and went down the bank at around 1pm. The driver of the truck and only occupant of the vehicle was transported to Middlemore Hospital with serious injuries. Part of the road was closed for several hours and diversions were put in place. 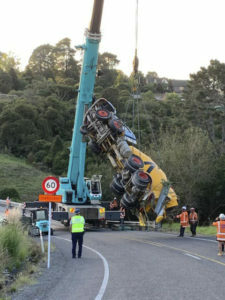 The truck hit the bridge handrail and Auckland Transport said a structural assessment of the handrail was undertaken. 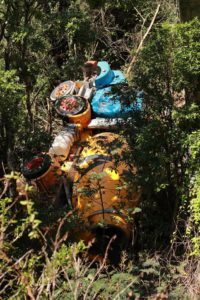 The handrail was strengthened last year so that it could withstand an impact loading such as the truck crash on Thursday. A Beca structural inspector visited the site on Tuesday. “His observation is that the damage only exists on the steel barrier and the parapet,” says AT spokesperson Mark Hannan. A 30 km/h speed limit has been imposed on the bridge and approaches, so that vehicles can continue to use the bridge. “The 30k limit is in place while repairs are done. Normally it is 60km/h and making that permanent is out for consultation at the moment,” Hannan said. Next articleOPINION: Has Nonu stepped into World Cup contention?